On first glance, Sweden’s FERAL stay strictly aligned to the Swedish Death Metal formula, with buzzsaw HM-2 guitars, inhuman death blasts, guttural fry vocals and an almost sub-audible low end decorating a melodic framework of horror attitude. As you dig deeper into their third full length album, “Flesh For Funerals Eternal”, you soon find there’s a lot more going on. 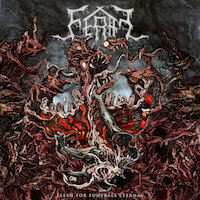 While many modern Death Metal bands stay at arms length from any semblance of melody and, dare I say it, fun, FERAL embraces the dark comedy and melodic sensibilities of Death ’n’ Roll, taking influence from that infamous period of the mid-90’s that saw stalwarts of the genre like ENTOMBED and DESULTORY daring to progress. It’s that spirit of rebellion, along with some remarkable production, that makes this album more than just a greatest hits and instead a truly feral piece of modern Death Metal. The album was mixed at Sonner Productions by Petter Nilsson and the result is sublime. Even in the most chaotic moments, the guitars are safely buzzing in their corners of the stereo field, with an infectious popcorn-like drum sound, a clearly audible bass, and vocals that are tucked comfortably in the mid-range of the sonic spectrum. David Nilsson’s vocals go from low guttural Viking shouts to borderline Deathcore screams in certain parts, like on the latter verses of the opener “Vaults of Undead Horror” and the chorus of “Black Coven Spirits.” This varied technique not only helps the listener hear the lyrics, but also makes for a more dynamic experience overall. “Gathering Their Bones” starts as a wicked foot stomper with a title-chanting chorus, whipping into a frenzy of groovy riffs about half way through. “Dormant Disease” is a scorcher with a classic ride-driven tempo that features some excellent bass playing from Viktor Klingstedt, including a run in the second verse that helps lift the song into another realm. Klingstedt also shines in “Of Gods No Longer Invoked” with a bass line in the intro and bridge sections that gives the song a Tech-Death vibe. The Vincent Price-narrated “Accursed” is a horror tale with some monster grooves and an outstanding drum solo from Roger Marström at the end that leaps out of the speakers. The band picks up the speed on “Horrendous Spirit” and gives us a straightforward “Wolverine Blues”-era banger. Indeed that once-maligned, now-celebrated album might be the main reference point here or perhaps the type of nuts-and-bolts Swedish Death that a band like BLOODBATH plays. Not lost on the record is the kind of analog Motörhead-influenced Rock ’n’ Roll spirit of a band like HIGH ON FIRE, which can be heard in the verses of the rollicking “Stygian Void.” Altogether these influences help give the album more dimension and texture than you may have expected.